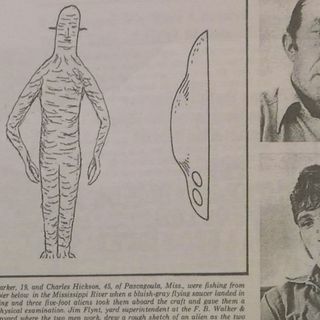 PASCAGOULA, MS (WLOX) - A UFO and alien abduction on the Pascagoula River: you may have heard this story from the 1970s. On Oct. 11,1973, Calvin Parker and now deceased Charles Hickson said while fishing they were pulled onto a space craft, examined and then ... See More put back down. "It scared the living hell out of you," Parker said. "I still have a few nightmares about it. I really think that I was abducted by some kind of life form from another planet." Parker and Hickson's story has made Pascagoula known around the world. On the same October 1973 night, not far from where the marker will be placed on the east bank of the river, Maria Blair was waiting with her husband Jerry Blair waiting for him to leave on a boat to work off shore. What she saw that night is something she’s telling for the first time publicly. “It was a warm night. It was like 73 degrees, and it was kind of easy to just sit in the car and wait for the captain to get there,” Blair said. While they were waiting Jerry went to sleep and Maria saw what she describes as strange, a blue light streaking back and forth. At the time she thought it was a plane or helicopter. “You don’t think it was a UFO,” Blair said. In 1973 Maria Blair and Calvin Parker were separated by a river. Now with a 45 year old secret washed under the bridge, Maria met Calvin face to face for the first time at the same spot on the Pascagoula River where the alleged abduction occurred.